After a little over a year of saving empty MAC packaging, I finally had enough for Back To MAC. In case you don’t know what that is, it consists of taking 6 empty product packaging (I had 5 eyeshadow compacts and 1 blush compact) and trading them in for your choice of eyeshadow, lipstick or lip gloss from their permanent range. 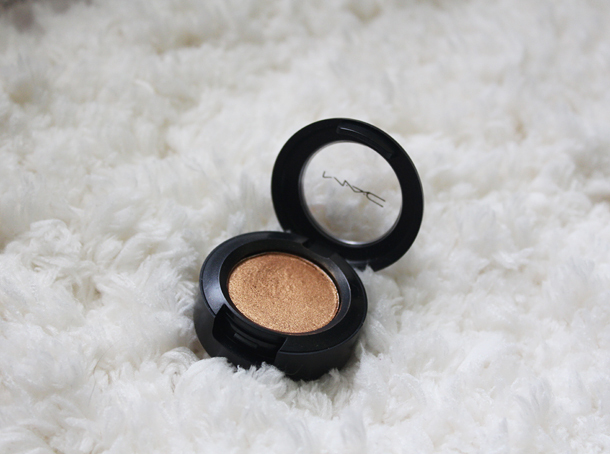 I’ve been on a nonofficial spending ban lately so getting a MAC eyeshadow for free felt pretty glorious. I picked the shade Amber Lights. 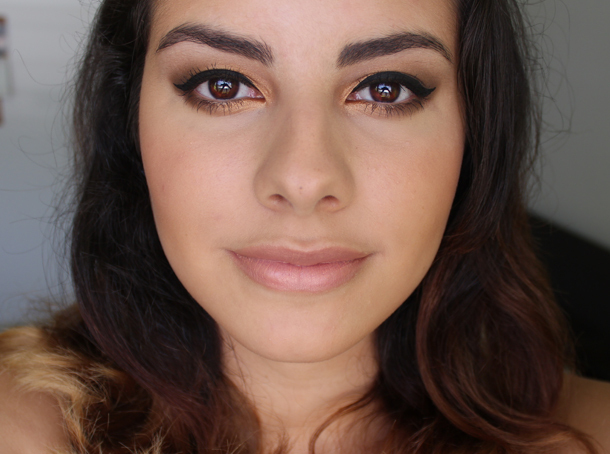 I’ve also included a full makeup look along with the review of this eyeshadow. I knew of Amber Lights‘ existence long ago. I was never interested in purchasing it because I thought it was like any other gold eyeshadow. It’s not. Amber Lights has a slight copper/orange undertone to it, hence why it’s called Amber Lights. Gold eyeshadows are typically yellow based so Amber Lights is different from other golds I’ve tried. It’s so pigmented and rich. The texture is amazing and the finish is so metallic that it looks a bit foiled. It was really Jessica’s video on her MAC Pro Eyeshadow Palette that convinced me to get it. Thanks for being an enabler, Jess. I love this eyeshadow! Such a shame someone broke your NARS Laguna, I think I would have shed a tear. What a great way to reuse packaging! And I love that eye shadow! I just may need to check out Amber Lights . . .
Amber Lights is a really gorgeous colour! It's so warm, but not overly orange. I really love it on you! Ahh this is a GORGEOUS look Coco! I love golds so this look is just right up my alley! Coco this look is GORGEOUS!!! I mean, getting something for free is great anyways but when it's beautiful as well? That's fantastic 🙂 And that's such a sad story about your Laguna bronzer; glad you were able to repress a different blush (and a gorgeous one at that) into the compact… I probably would have saved it as well haha. I have wanted amber lights to for such a long time now I have enpven more of an excuse to purchase! Oooo, look at that Hot Mama. 😉 Amber Lights really does look pretty! I love the copper tones in Amber Lights! Definitely added to my MAC wish list! Bella, y como te resaltan los ojos esos colores. Love it. This looks so great on you! Oh wow Coco you look AMAZING. This looks crazy beautiful on you. You look stunning as always! I love Amber lights but I always forget that I have it – I must remember because it's so gorgeous! Gorg! I love the brightness it brings to you eyes and it looks so good against your skin and dark hair! 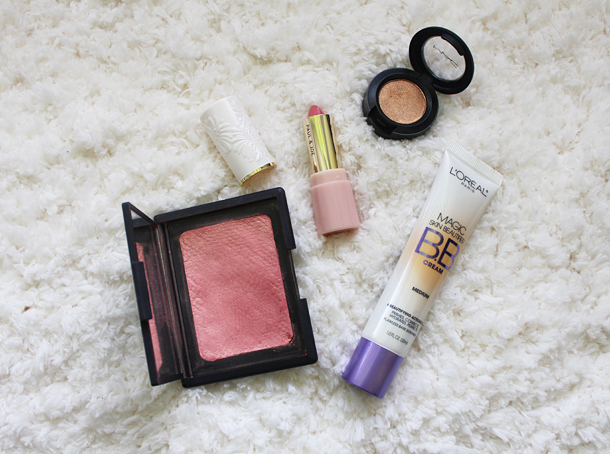 Amber Lights looks gorgeous on you – very flattering for your skin tone! I find yellowish golds don't really look good on me – need to look into more coppery/amber ones. And you did a great job putting that blush into the Laguna packaging! 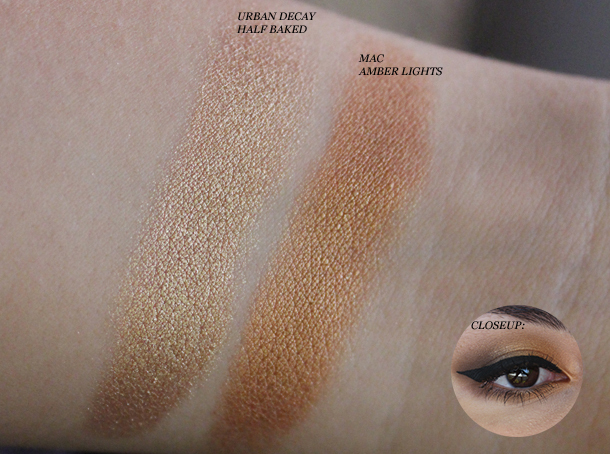 I always avoid Amber Lights but it looks like I might be heading to MAC soon. Great job on the blush–I would have never know the difference. I want amber lights so bad! The name is beautiful and so is the shade! I love the look of it one you especially! Beautiful look. I so wish I was good at applying eyeliner. I'm rubbish at it. Lovely post. LOL, is it odd to LOVE being an enabler? And I'm glad I was able to enable you (that sounds funny out loud) because it looks STUNNING on you! Oh my lanta, how'd you get it to look 10 x nicer than I already pictured it? I know need Wedge and Espresso, so THANK YOU for being an enabler, haha! such a pretty look! I bet that back 2 mac felt goooood haha! Amber lights kind of looks like one of my old time favourite e/s woodwinked. I'm going to look at swatches right after this, I might be needing to add amber lights to my collection. Ok, I definitely NEED Amber Lights! So pretty! Love love love the eye look! The gold paired with that tiny bit of smokiness reminds me of something you'd see in a Victoria's Secret show! It looks amazing on a tanned skin like you're own, I'm not sure how this colour would go on my pale skin though, it looks like it has the potential to lean quite orange. Ive found the balm products break- my mary loumanizer has twice ! pretttttyyy! i cant wait to re-create it! i was just reading your eye lid primer blog post and i am the exact same way! i write as if people know what i am talking about…i probably shouldnt do that- haha!